Deutsch: Flagge Portugals, entworfen von Columbano Bordalo Pinheiro (1857-1929), offiziell von der portugiesischen Regierung am 30. Juni 1911 als Staatsflagge angenommen (in Verwendung bereits seit ungefähr November 1910). 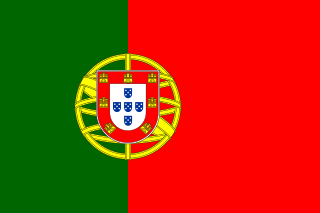 Português: Bandeira de Portugal, criada por Columbano Bordalo Pinheiro (1857-1929), adotada oficialmente pelo governo português em 30 de junho de 1911 (em uso desde novembro de 1910). The original of this vector set was contracted by the Portuguese Presidential Office in June 2004 to Vítor Luís Rodrigues and António Martins-Tuválkin expressly to be released in public domain. 이 작품은 미국, 그리고 저작권 보호 기간이 저작자 사후 70년, 또는 그 이하인 모든 국가에서 퍼블릭 도메인입니다. You must also include a United States public domain tag to indicate why this work is in the public domain in the United States. 일부 국가는 저작권을 사후 70년보다 더 길게 적용하고 있으므로 주의가 필요합니다. 멕시코는 100년, 자메이카는 95년, 콜롬비아는 80년, 과테말라와 사모아는 75년을 저작권 보호 기간으로 적용하고 있습니다. 따라서 해당 국가에서 이 작품은 퍼블릭 도메인이 아닐 수 있으며, 저작권 상호주의 또한 적용되지 않을 수 있습니다. 코트디부아르 공화국은 99년, 온두라스 공화국은 75년의 보호기간을 규정하고 있지만 이 두 국가에서는 상호주의를 적용하고 있습니다. 이 작품은 1924년 1월 1일 이전에 출판하였으므로 미국에서 퍼블릭 도메인입니다. 퍼블릭 도메인 작품을 공용에 올리기 위해서는 미국과 작품의 제작 국가에서 저작권이 만료되어야 합니다. 미국에서 제작된 작품이 아닐 경우, 제작 국가에서의 저작권 상태를 나타내는 저작권 태그를 반드시 추가로 부착해야 합니다. 이 그림은 깃발, 국장 등의 공식 휘장을 보여 주고 있습니다. 이러한 그림의 사용은 많은 나라에서 제한되어 있습니다. 이 제한은 저작권과는 별개로 적용됩니다. 현재 2014년 9월 1일 (월) 21:22 600 × 400 (13 KB) Steinsplitter Fulfilling edit request by SiBr4. Thanks for helping! 2010년 3월 11일 (목) 14:03 600 × 400 (63 KB) Zscout370 Alright, finally got an EPS viewing program, using the colors directly from the file. 2010년 2월 5일 (금) 06:43 600 × 400 (76 KB) Bluedenim Dark green is: 0-102-0. Red is: 255-0-0. 2010년 2월 4일 (목) 01:40 600 × 400 (76 KB) Bluedenim the source for this version is the best that one could get. A flag isn't a fashion item. It doesn't matter if it "looks good" or if it "looks bad". 100개 이상의 문서가 이 파일을 사용하고 있습니다. 다음 목록은 이 파일을 사용하는 처음 문서 100개만 보여주고 있습니다. 이 파일을 사용하는 모든 문서 목록을 볼 수 있습니다. 이 파일의 더 많은 사용 내역을 봅니다. 이 파일에는 카메라나 스캐너가 파일을 만들거나 디지털화하는 데 사용하기 위해 기록한 부가 정보가 포함되어 있습니다. 프로그램에서 파일을 편집한 경우, 새로 저장한 파일에 일부 부가 정보가 빠질 수 있습니다.